The term “Vel’ d’Hiv’ Roundup” designates the biggest razzia of Jews on French territory, which was carried out by French policemen in Paris on 16 and 17 July 1942. Before being deported to the extermination camps in Eastern Europe, over 13.000 men, women and children were detained in the “Winter”-stadium (Vélodrome d’Hiver) under very poor conditions. This action organized by the French Vichy-Regime collaborating with Hitler-Germany had been a taboo in France for a long time. It was not before 16 July 1995 that the French President Jacques Chirac acknowledged for the first time French complicity in the Holocaust. « Chassez les Papillons Noirs » (Chase away the black butterflies) is the title of the biography of the holocaust survivor Sarah Lichtsztejn-Montard. In her biography she tells how, as a fourteen year old girl, she first managed to escape from the Winter velodrome together with her mother, before being denounced by neighbours about two years later and deported to Auschwitz; both survive the death march and are finally liberated by British troops in the camp Bergen-Belsen on 15. April 1945. In 2011, Roman Kroke created the illustration Chassez les Papillons noirs (Chase away the black butterflies) which is based on the biography of the holocaust survivor Sarah Lichtsztejn-Montard. 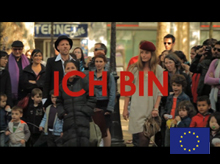 The illustration was a commissioned artwork for the documentary film Ich bin (2011) by André Bossuroy, sponsored by the European Commission. 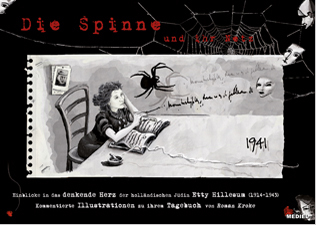 With respect to the concept of the illustration: When Roman met Sarah in Paris on occasion of the shooting of the film Ich bin, Sarah told him that during her imprisonment in the extermination camp Auschwitz-Birkenau she and the other girls often sang the refrain « Chassez les Papillons Noirs … » (Chase away the black butterflies) of the song Le disque usé (1943) by Édith Piaf (http://www.youtube.com/watch?v=vS5X0BRB12s). In fact, for Sarah music has been an invigorating force and source of joy throughout the entire life. The therefore also chose the refrain « Chassez les Papillons Noirs … » as the title of her biography. In his illustration Roman Kroke creates a symbiosis between this biographic reference and the universal question of how a human being may cope with traumatic experiences and transform them – at least partly – into a creative impetus. 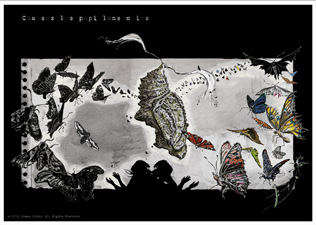 Roman Kroke’s illustration Chassez les Papillons noirs (Chase away the black butterflies), based on the biography of Sarah Lichtsztejn-Montard, was a commissioned artwork for the documentary film Ich bin (2011) by André Bossuroy, sponsored by the European Commission. Ich bin is a historical documentary addressing the memory of the victims of Nazism and of Stalinism. Four young Europeans meet with historians and witnesses of our past. They investigate diverse events of the Second World War in Germany (the student movement of the White Rose in Munich), in France (the Vél’ d’Hiv’ Roundup in Paris as well as the resistance in Vercors) and in Russia (Katyn forest massacre). They examine the impact of these events; curious to how the European peoples are creating their identities today.